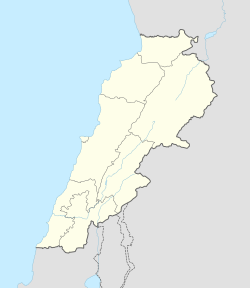 Yater (Arabic: ياطر) is a Lebanese municipality located in Bint Jbeil District. It is 112 kilometers away from Beirut. E. H. Palmer wrote that the name Yater came from a personal name. In 1852, Edward Robinson visited and found "some few remains of antiquity", including two excavated chambers at the south of the village. In 1875 Victor Guérin found Yater to have 160 Metawileh inhabitants. He further said that the ancient name of Yater must have been Yattir or Jether; "Two other rocky hills, situated, the first to the south, the second to the south-west of this village, served as cemeteries to the ancient city. All the stones with which it was built were taken from this place. Vast quarries, cisterns, presses, and tombs, have been cut in the sides and on the summits of these hills, which are separated by a narrow valley. The greater contained each nine loculi, grouped three to left, and at the end under a vaulted arcosolium. The facade of two among them is pierced by several small niches, some designed for simple lamps, others for statuettes. One of these caves seems to have been set aside for some sacred purpose." According to the SWP: "There are three rock-cut tombs, with side loculi and kokim, at this village; one of these has an olive-press inside. The rock is much quarried round, and the place has the appearance of having been an ancient site. There is also a rock-cut wine-press and ruined birkeh. To the north-west there are two ruined watch-towers, with rough-hewn stones. To the north there is another similar, with a cistern." In 1881, the Palestine Exploration Fund's Survey of Western Palestine (SWP) described it as: "A stone village, containing about 300 Metawileh, situated on hill-top, with olives and arable land about, having a birket and many cisterns and a spring near it." This page was last edited on 19 April 2019, at 22:06 (UTC).